I recall that Boxing Day had its origins in England, as a day when the household staff could take a day off to spend with their families. For the occasion, they would carry boxes of leftovers from the fancy Christmas meal. For me, Boxing Day has another meaning – putting away Christmas decor into boxes for storage. It’s a dreaded, but necessary task – and I find that it’s best tackled straight away after Christmas. I put some bluegrass music on the stereo and managed to get almost everything put away in three hours. As I worked, I munched on the last of our Moravian Cookies and looked back on this year’s collection of holiday memories. My heart is filled with Christmas Spirit. This is The Day! We traditionally spend Christmas morning with our family members in Wilson County. It’s a breakfast event, and I wouldn’t dream of going empty-handed, so I always make a batch of Paula Deen’s Baked Garlic Cheese Grits to carry with me. It’s a recipe that takes over an hour to prepare, and then it takes another hour to get to our destination – so I’m up and in the kitchen early. While I’m there, I start a slow cooker with Pork Carnitas for our dinner. Santa has visited our two young nieces; as my sister-in-law prepares homemade biscuits in the kitchen, we get a tour of the girls’ bedrooms (wondering how a 7-year old can sleep on a bed with no fewer than 50 stuffed animals on it), where they display the gifts the jolly old elf delivered during the night. Before we dig into breakfast, my brother-in-law-the-deacon offers a special Christmas blessing – for a moment after, we are gathered in warm and loving silence – and then the eating begins! This is a fantasy breakfast, of chocolate croissants, and ambrosia, scrambled eggs, biscuits and gravy, country ham, buttered toast – and of course cheese grits. This is a tradition in my husband’s family that goes back to his childhood, and we’re so grateful that my sister-in-law hosts Christmas breakfast. After the dishes are tucked into the dishwasher, we spend a few minutes watching our nieces unwrap their gifts from us and the other adult family members (we no longer exchange gifts among adults). In my childhood years, my family always did most of its celebrating on Christmas Eve. We’d have a family dinner (not unusual for us – we always ate dinner together), and once we had finished the dishes, we could gather around the Christmas tree, where my father would orchestrate the present-opening. It works out schedule-wise that my husband and I have adapted this tradition to our own household. This is one of the few occasions where we turn off the television for a while. I prepare a special dinner (steaks this year), and we dine in the dining room with Christmas music. After dinner, we exchange our gifts. We’re not great at keeping secrets from each other, but there are usually one or two unexpected items under the tree. It’s a quiet time together, and one I cherish. p.s. For most years, this is a moment in front of the fireplace – but, since we have had record-breaking heat this Christmas, the reality is that much of our evening together was spent on the screened-in porch! Have you ever had a Worst Christmas? I can’t say that I have, but I know that some of my friends are probably feeling that way about Christmas 2015. These are friends who have experienced heartbreak during the holidays. Whether its the breakup of a relationship, the death of a loved one, the loss of a cherished job, or simply the loneliness of an empty nest – somehow we believe that the world stops turning during the holidays, and that the worst we’ll have to face is a reprise of the family dysfunction we braved at Thanksgiving. Forced gaiety seems inappropriate. This is a time when the best gift I can give is an ear to listen, perhaps followed by prayer. Life’s tragedies make me focus on the Meaning of Christmas. I’m so excited about tomorrow that I can’t sleep. I’ve got a fresh haircut, am about to give myself a deluxe home mani/pedi, and I’ve gone back and forth about 40 times as to what I’ll wear. Tomorrow is the big day – The Girls and I are going into The City! First, we’ll valet park at the Hermitage Hotel, where we’ll enjoy an elegant lunch at Capitol Grille. Napkins in lap, elbows off table – we’re going to really stand out in the lunchtime crowd of businessmen! And after lunch (and maybe a quick peek at the world famous men’s restroom) we’re headed to the Jackson Hall at the Tennessee Performing Arts Center to see a matinee performance of Nashville’s Nutcracker! Can you imagine our delight?!? What a special adventure it will be for us all! This weekend – with less than a week to go until Christmas – we’re planning a special outing with dear friends. We’ll leave the house shortly after dark, and make our way over to Cheekwood for their Holiday Lights display. It’s gotten cold enough for winter coats in the evenings, so I’ll finally have occasion to wear my fabulous Christmas Parade coat as we stroll the grounds of the former Cheek family residence. We have dinner reservations at nearby 360 Bistro, an elegant but often-overlooked restaurant in Belle Meade. After dinner, we’ll follow a circuitous route home, winding through some of Nashville’s loveliest neighborhoods to enjoy the holiday lights and festive decor. It promises to be a low-stress evening full of laughter and beauty. I do believe this Hunt for Christmas Spirit is working – I’m feeling decidedly merry as I head into Christmas Week! Last year, when faced with the challenge of attending an Ugly Christmas Sweater party, I found myself scrambling to find ideas. It turns out that, even though I formerly was the proud owner of such festive garb, I had long since purged these items from my closet. I finally found a used sweater on eBay that wasn’t too expensive – but I was concerned that it was too subdued for a holiday party. My solution? The Holiday Fascinator! My fascinator was so much fun to make and wear – and just the right touch to complement my ugly sweater! At the end of the evening, I gave my festive headgear to a woman who had admired it (because really, wouldn’t it be tacky to be seen in that thing twice?!?). This year, when planning my get-up for Dickens of a Christmas in downtown Franklin, I knew that I wanted to do another fascinator. Since I was going to be in public with my 11-year-old nephew, I knew that I’d have to plan carefully to exact just the right mortification level. My candy cane-striped Christmas tree hit just the right notes, and it was so comfortable that I wore it into the evening, as we stopped by Douglas Corner pub to see some old high school classmates perform in The 1969 Band Holiday Party. And, as last year, at the end of the evening I gave my fascinator to a woman who had admired it. When I have a cookie exchange to attend, I might break out the cookbook and try some new recipes – but there are two types of baked sweet treats that come from my kitchen every year: Moravian Ginger Cookies and Baklava. Ever since I visited Old Salem, North Carolina, I’ve been a fan of the paper-thin, brittle-crisp spice cookies that come from the Moravian bakers in that community. Frankly, it never occurred to me to bake my own until a neighborhood woman invited me into her kitchen for an afternoon of cookie baking. Then, I happened upon the recipe in a very old cookbook (priced $1!) left behind by the previous homeowner for a house we bought in the Virginia mountains. This recipe calls for use of a floured cloth – you could use an old floursack dish towel – work flour into the fabric with a knife or other flat-edge utensil before using. Mix butter, sugar, molasses. Then add dry ingredients and grape juice, and stir to mix well. (VERY stiff dough) Cover and keep in cool place at least 3 days to ripen. Roll VERY thin (use a cloth-covered, floured board, and plenty of flour). Cut with fancy cutters, place gently on cookie sheets and bake at 275 F for 8 to 10 minutes. Store in air tight container indefinitely. For the baklava, we simply use Alton Brown’s recipe, although we don’t use walnuts and up the pistachio content instead. Rose water (for spritzing), like all other things, is available from Amazon. One bottle will last a lifetime! I was fortunate to catch Belmont University’s production of Irving Berlin’s “White Christmas“ this year. The storyline – set in a Vermont inn that was suffering from a lack of snowfall – seemed especially appropriate, since we’re having such a warm December in Nashville. The Belmont School of Music does a great job with this musical – the singers and dancers gave strong performances – and the audience enjoyed singing along for the final reprise of White Christmas at the end of the show. Christmas time bring out the crafter in me. Whether it’s collecting prickly sweetgum pods to paint and glitter for the tree, or sewing custom re-usable gift bags, or figuring out what to do with all the wine corks I’ve saved – something deep within my DNA urges me to make something by hand for the holidays. This year, I decided to develop a new skill, and signed up for a rug-braiding class through the Adult Education program at Cohn High. Almost half-way through my first project – a coaster – and I already know that this won’t be the craft for me. But, I’m glad I discovered this before I started tearing up all my old woolens to create rags! Still, the sense of community is appealing to me, as I sit with my fellow braiders (many of whom, I’m told with a wink and a grin, are also hookers – which means that they make hooked rugs too). The more experienced braiders bring in finished products about the size of a bathmat, explaining that they invested over $50 in materials for their homemade masterpieces. I think I’ll stick to crafts that involve my glue gun and wine corks! Do you know anyone who shops at a mall anymore? I honestly can’t remember the last time I got together with girlfriends to go shopping, and we wound up at a mall. On the other hand, last weekend I spent a lovely afternoon with friends, shopping the boutiques and vintage shops in Nolensville, TN. To fuel us for our afternoon, we first feasted at Nana’s Diner, an old-fashioned meat-and-three located right in the middle of our shopping district. The catfish was fried, the green beans were Southern-style, and our only complaint was that the menu didn’t include fried okra. And we gossiped. On to the shopping – most of the stores we visited sell vintage and “repurposed” items. And chalk paint. Just about every store we visited had at least one display of chalk paint for sale! To get to Nolensville from Nashville, take I-65 South to the Concord Rd. exit, turn left and go to the intersection at Sunset Drive. Turn right on Sunset Drive and take it all the way to Nolensville Rd. This puts you right in the middle of the business district – turn right if you want to want to shop vintage! I love wearing holiday spirit on my sleeve – literally! No matter the fashion trend, it’s always appropriate to wear red in the Christmas season. I’m starting to feel the first stirrings of excitement about the holidays – perhaps this hunt will be worthwhile! First stop on the way to Christmas Spirit – we stopped at Rice’s Farms in Mt. Juliet to pick up a country ham. Even though the venerable Ricky Skaggs claims that “You Can’t Hurt Ham,” picking and preparing an authentic cured ham is a challenge we savor each holiday season. Edward Rice & Sons has been selling country hams from their store on Lebanon Rd. in Mt. Juliet for as long as I can remember (I last lived in Mt. Juliet 34 years ago, as a newlywed). Their store is only open a few months a year – but as we all know, smoked meats have become the “it” culinary item in recent years – so they also accept online orders during the off season of January to March. I don’t know if you can read the signs on the wall in the picture – but a Rice’s championship ham can bring over nine grand at auction. I hope our holiday guests won’t mind that our ham cost less than 1% of that. They take their quality seriously, though – once you’ve selected your ham from the “ham wall,” they test the ham by poking it several inches deep with an ice pick, then sniffing the ice pick. This apparently helps them detect areas of a ham that haven’t cured properly. Leave the insulation around the ham pot for 24 hours. The ham can then be taken out and is ready to slice and eat! I personally think that the trick to successful country ham – whether served boiled or fried in a skillet, is that the ham must be thinly sliced. 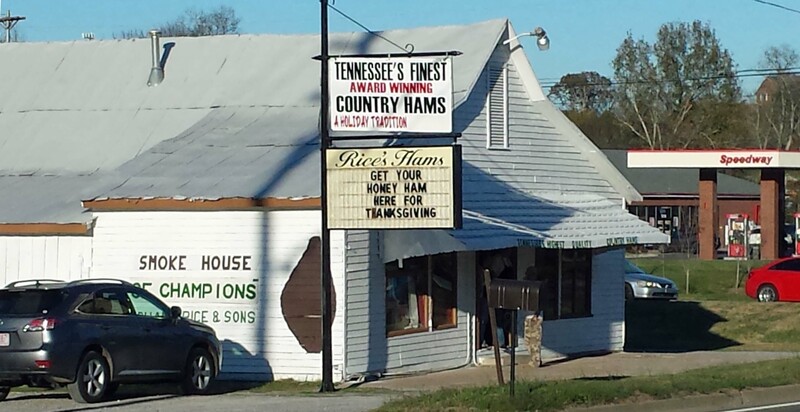 Truth be told, we serve our ham at Thanksgiving, alongside the turkey. But that’s just because a whole country ham is a whole lot of meat, and we don’t serve that many people except at Thanksgiving. Still, I think it counts as part of our Christmas holiday because thanks to “no expire date,” we’ll be using the leftovers all through December! I’m starting to panic. Here it is, two weeks after Halloween, and it seems everyone else is already Decking the Halls. Lighting displays are being lit, carols are playing in the background of nearly every store I enter, and television commercials are hinting that “what she really wants is an Audi for Christmas.” Now, I feel that I’ve finally mastered the fact that Daylight Savings Time has been expanded by four weeks (it only took me 8 years to adapt!) – but I’m really struggling to embrace that the holiday season now starts well before Thanksgiving, and extends into mid-January. For this topic, I’m going to try something a little different – instead of writing each entry as a separate post, I’m going to expand this entry as I make my way through the holidays, putting new information at the top (and changing the picture). Then, next year, I hope you (and I) will be able to look back on this as a roadmap to making the most of Christmas. 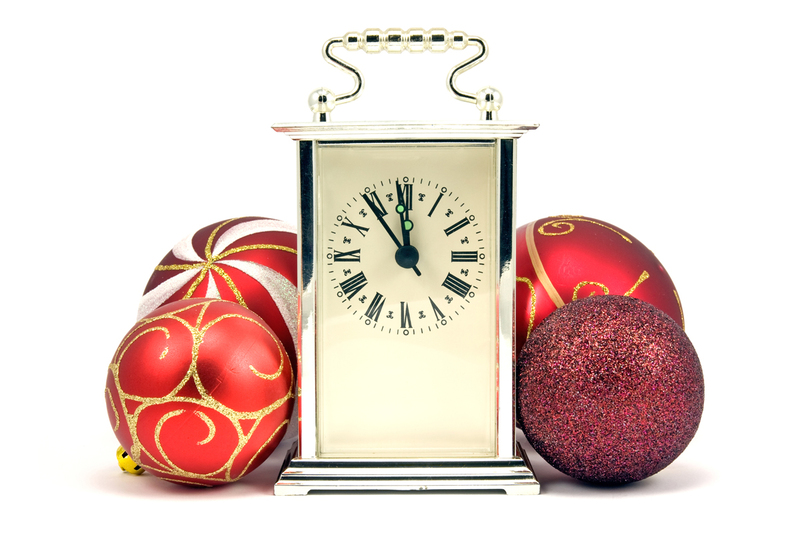 So, let’s set our clocks to Holiday Savings Time, and embark on the Hunt for Christmas Spirit!